I remember getting a few of these when I was growing up. I used to save the plastic container and use it for storing trinkets. I found these for sale on eBay, not sure I'd want to eat the 20 year old candy. 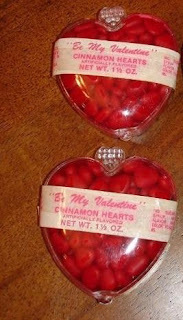 I think you can still buy these today. Posted by Karen at 3:22 p.m. They sell these in my hubby's store here in Sk. Too hot for me. I also remember getting these cases, now they come in bags. My husband pointed me to your site. I love it. Thanks for sharing!! !